The Global Maritime Distress Safety System (GMDSS) is an internationally agreed-upon set of safety procedures, types of equipment, and communication protocols used to increase safety and make it easier to rescue distressed ships, boats and aircraft. One VHF radio capable of DSC (Digital Selective Calling) on channel 70 and voice communications on channel 16, 13 and 6. One SART (Search And Rescue Transponder) if under 500 gross tons otherwise two. Two approved lifeboat portable VHF radios if under 500 gross tons otherwise two. One Navtex receiver or an Inmarsat EGC receiver if operating in an area where Navtex is not offered. One 406 MHz or a 1.6 GHZ satellite EPIRB, (Emergency Position Indicating Radio Beacon). Note: a VHF DSC EPIRB may replace the 406 MHz and 1.6 MHz EPIRB if operating exclusively in area A1. One MF (Medium Frequency) radio installation capable of transmitting and receiving on the frequencies 2187.5 kHz using DSC and 2182 kHz using radiotelephony. One DSC watch keeping receiver operating on 2187.5 kHz. One 406 MHz EPIRB. A HF radio installation operating on working frequencies in the (marine) bands between 1,605 kHz and 27,500 kHz. (This requirement is normally fulfilled by the addition of this capability in the MF equipment referred to in item 2). One Inmarsat C ship earth station. One MF radio installation and 2187.5 kHz DSC watch keeping receiver. One MF/HF radio installation capable of transmitting and receiving on all distress and safety frequencies in the (marine) bands between 1,605 kHz and 27,500 kHz: using DSC, radiotelephony and NBDP (Narrow Band Direct Printing Telex). One MF/HF DSC watch keeping receiver capable of maintaining DSC watch on 2187.5 kHz, 8,414.5 kHz and on at least one of the distress and safety DSC frequencies 4207.5 kHz, 6312 kHz, 12577 kHz or 16804.5 kHz at any time. It is possible to select any of these DSC distress and safety frequencies. One MF/HF radio installation as described earlier. One MF/HF DSC watch keeping receiver as described earlier. One 406 MHz EPIRB. Note: Satellite based systems do not operate in the A4 Polar Regions. In addition to the carriage requirements, regulation 15 of the SOLAS GMDSS regulations defines 3 methods to ensure availability of GMDSS equipment at sea. At sea electronic maintenance, requiring the carriage of a qualified radio/electronic officer (holding a GMDSS First or Second Class Radio-Electronics Certificate) with adequate spare parts and service manuals. Shore based maintenance contracts. Almost exclusively vessel operators opt for duplication of equipment or shore based maintenance contracts. Recreational vessels do not need to comply with GMDSS radio carriage requirements, but will increasingly use the Digital Selective Calling (DSC) VHF radios and offshore vessels may elect to equip themselves further. Vessels under 300 Gross tonnage (GT) are not subject to GMDSS requirements and vessels from 300 to 500 GT have less restrictive carriage requirements than vessels 500 GT and over. Contact us today for a free consultation! 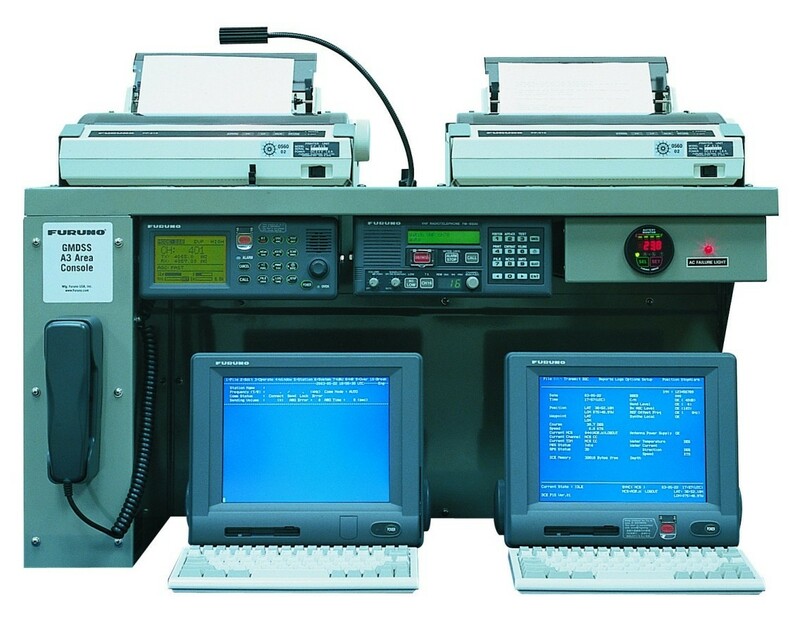 Furuno GMDSS JRC GMDSS Simrad GMDSS All Products Index in Alphabetical Order Carriage Requirements for GMDSS A1: One VHF radio capable of DSC (Digital Selective Calling) on channel 70 and voice communications on channel 16, 13 and 6. One SART (Search And Rescue Transponder) if under 500 gross tons otherwise two. Two approved lifeboat portable VHF radios if under 500 gross tons otherwise two. One Navtex receiver or an Inmarsat EGC receiver if operating in an area where Navtex is not offered. One 406 MHz or a 1.6 GHZ satellite EPIRB, (Emergency Position Indicating Radio Beacon). Note: a VHF DSC EPIRB may replace the 406 MHz and 1.6 MHz EPIRB if operating exclusively in area A1. A2 (in addition to A1 equipment): One MF (Medium Frequency) radio installation capable of transmitting and receiving on the frequencies 2187.5 kHz using DSC and 2182 kHz using radiotelephony. One DSC watch keeping receiver operating on 2187.5 kHz. One 406 MHz EPIRB. A HF radio installation operating on working frequencies in the (marine) bands between 1,605 kHz and 27,500 kHz. (This requirement is normally fulfilled by the addition of this capability in the MF equipment referred to in item 2). A3 (in addition to A1 and A2 equipment): One Inmarsat C ship earth station. One MF radio installation and 2187.5 kHz DSC watch keeping receiver. One 406 MHz EPIRB. OR One MF/HF radio installation capable of transmitting and receiving on all distress and safety frequencies in the (marine) bands between 1,605 kHz and 27,500 kHz: using DSC, radiotelephony and NBDP (Narrow Band Direct Printing Telex). One MF/HF DSC watch keeping receiver capable of maintaining DSC watch on 2187.5 kHz, 8,414.5 kHz and on at least one of the distress and safety DSC frequencies 4207.5 kHz, 6312 kHz, 12577 kHz or 16804.5 kHz at any time. It is possible to select any of these DSC distress and safety frequencies. One 406 MHz EPIRB. A4 (in addition to A1, A2 and A3 equipment): One MF/HF radio installation as described earlier. One MF/HF DSC watch keeping receiver as described earlier. One 406 MHz EPIRB. Note: Satellite based systems do not operate in the A4 Polar Regions. In addition to the carriage requirements, regulation 15 of the SOLAS GMDSS regulations defines 3 methods to ensure availability of GMDSS equipment at sea. At sea electronic maintenance, requiring the carriage of a qualified radio/electronic officer (holding a GMDSS First or Second Class Radio-Electronics Certificate) with adequate spare parts and service manuals. Duplication of certain equipment, or; Shore based maintenance contracts. Almost exclusively vessel operators opt for duplication of equipment or shore based maintenance contracts. Recreational vessels do not need to comply with GMDSS radio carriage requirements, but will increasingly use the Digital Selective Calling (DSC) VHF radios and offshore vessels may elect to equip themselves further. Vessels under 300 Gross tonnage (GT) are not subject to GMDSS requirements and vessels from 300 to 500 GT have less restrictive carriage requirements than vessels 500 GT and over.